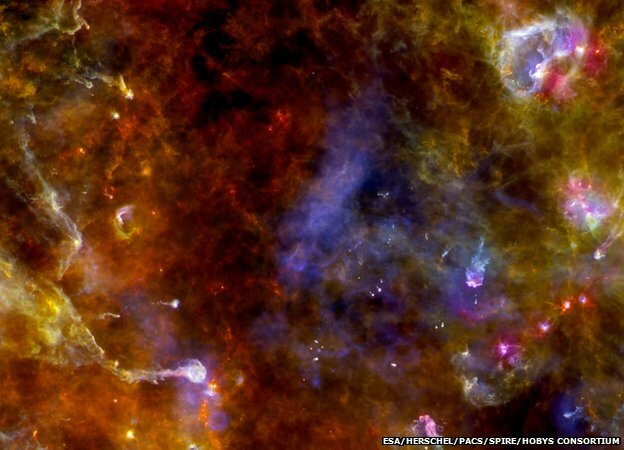 Europe's billion-euro Herschel space observatory has ended its mission to image the far-infrared Universe. 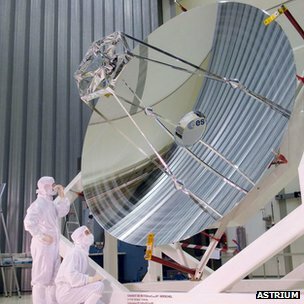 Europe's flagship space telescope has stopped working. The billion-euro Herschel observatory has run out of the liquid helium needed to keep its instruments and detectors at their ultra-low functioning temperature. This equipment has now warmed, meaning the telescope cannot see the sky. 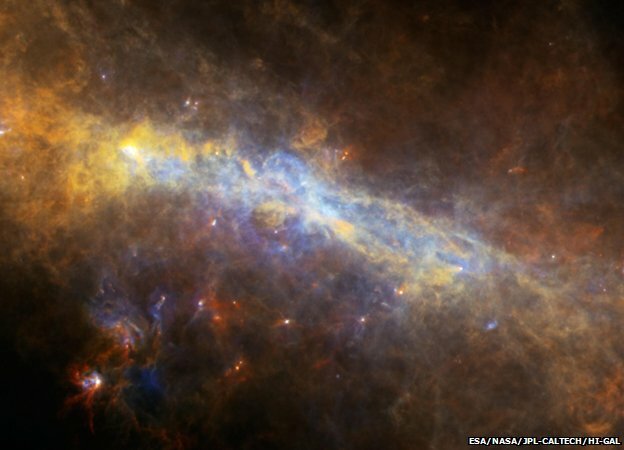 Herschel, which was sensitive to far-infrared and sub-millimetre light, was launched in 2009 to study the birth of stars and the evolution of galaxies. Its 3.5m mirror and three state-of-the-art instruments made it the most powerful observatory of its kind ever put in space. The end of operations is not a surprise. Astronomers always knew the helium store onboard would be a time-limiting factor. The "blind" satellite is currently located about 1.5 million km from Earth on the planet's "night side". Controllers at the European Space Agency's (Esa) operations centre in Darmstadt, Germany, will run some final tests on the spacecraft in the coming weeks before putting it in a slow drift around the Sun. "We will push it out into a heliocentric orbit and passivate it," said Micha Schmidt, the Herschel spacecraft operations manager. "We will switch off the transponder and the spacecraft will go silent." Herschel should not come anywhere near the Earth again for several hundred years. The telescope will be remembered for its great vistas of gas and dust; the billowing clouds and threading filaments that trace the locations where future stars will form. Over the course of the mission, it gathered thousands of such images. It also acquired detailed spectrographic data on many of its subjects, revealing their chemistry. All of the information is now being assembled into a public archive. This will become an important resource for future study and a starting point to plan follow-up observations with other astronomical facilities. This is already happening with the recently opened, ground-based Alma telescope in Chile, which views the sky at frequencies that overlap those pursued by Herschel. A US-German telescope called Sofia, which is mounted on a converted Boeing 747, can also see some of Herschel's frequencies. "But the amazing thing about Herschel is that its maximum productivity in science terms probably won't be reached for another five years yet," said Prof Matt Griffin, the principal investigator on Herschel's Spire instrument. 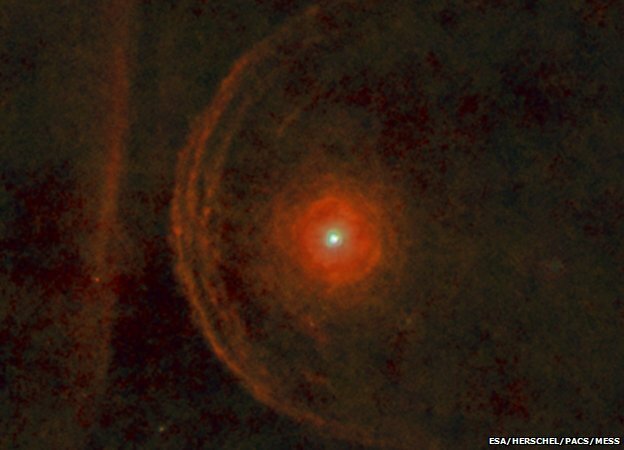 "The telescope gathered images and information in such volume that astronomers have barely scratched the database," the Cardiff University, UK, scientist told BBC News. 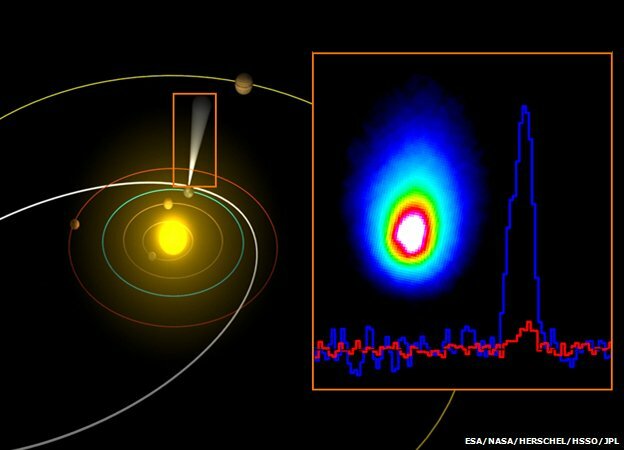 Engineers issued an alert early in March warning astronomers that observations were coming to an end. 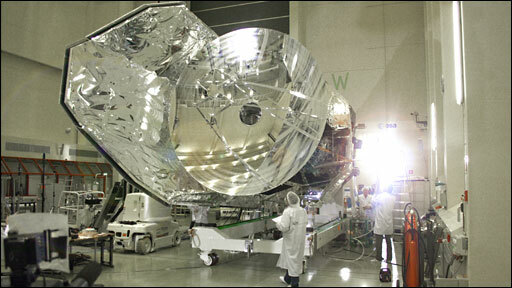 Herschel used special light detectors in its instruments known as bolometers. Although supremely efficient at capturing light, the technology must be kept close to absolute zero (-273C) to work properly. This was achieved with the aid of 2,300 litres of liquid helium that was held in a giant flask, or cryostat. But as the mission progressed, the cryogen gradually boiled away, and, on Monday, the Darmstadt controllers received telemetry from Herschel confirming every last drop was gone. 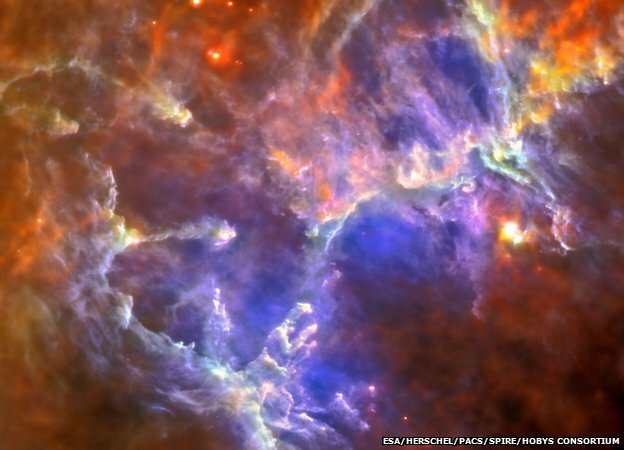 Like hot tea behind a bin bag - how does Herschel let us see hidden stars? Herschel's demise occurred close to the time forecast at the start of operations nearly four years ago. 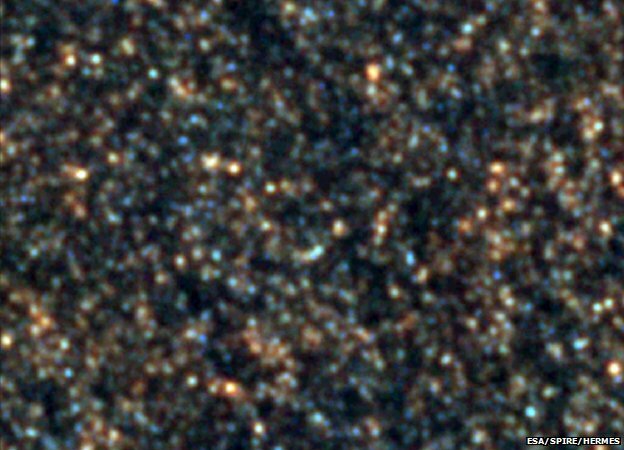 If anything, astronomers got a few months' more observations than they were expecting. 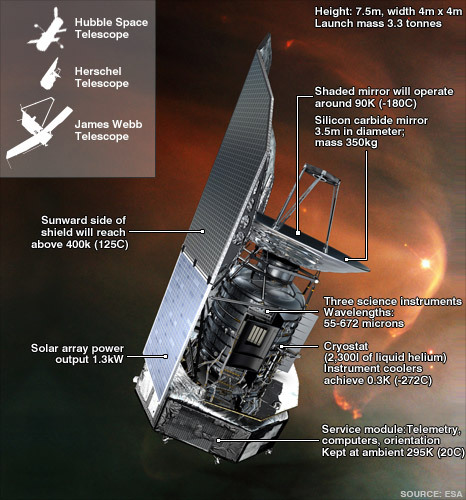 Herschel's cryostat approach to cooling was evolved from a previous Esa mission - the Infrared Space Observatory (ISO), which operated in the 1990s. This approach is described as a "passive" system because once initial conditions are set inside the flask, a continuing presence of helium and good insulation is all that is required to maintain those conditions. 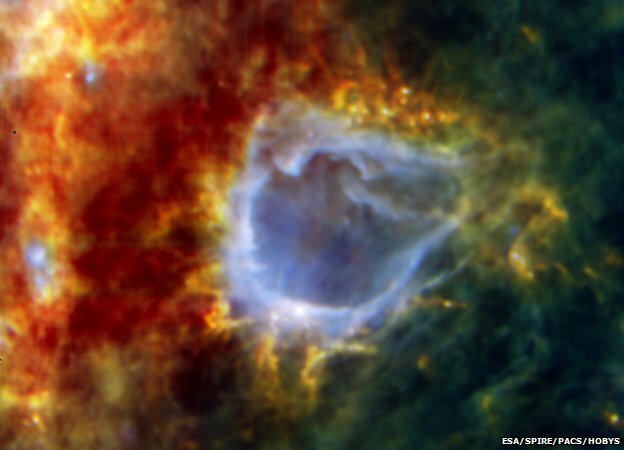 An "active", or mechanical, cooling system was considered for Herschel in the initial feasibility studies. This would have involved a chain of Stirling units that use a cycle of compression and decompression in a fluid to get to low temperatures. Theoretically, mechanical coolers could have given Herschel more life, but engineers considered such a design to be too risky. "There was a competitive concept but it involved a lot of stages, a lot of machines," recalls Jean-Jacques Juillet, the director of scientific programmes at Thales Alenia Space, the company that led the industrial development of Herschel. "If one of those stages had failed, it could have been a disaster for the continuity of the mission. The cryostat option was the safest option," he told BBC News. With the cryostat path adopted, engineers then set about constructing the largest possible helium vessel they could fit inside an Ariane launch rocket. 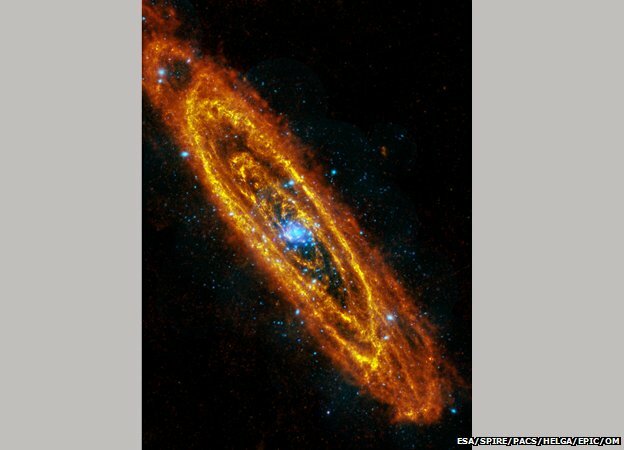 Esa hopes to join a future far-infrared telescope project called Spica. This is a Japanese venture that could fly in the early 2020s. Europe would provide important components, including the primary mirror and a spectrograph. Unlike Herschel, Spica is likely to use mechanical coolers. Researchers in the US copy bird and bat wings to build a drone that can rebound and recover from mid-air collisions.